Sin — it is one of those things that people don’t want to talk about. It is perhaps the one word in the English language that has so many synonyms and excuses that you can easily lose count. It is something that no human being can escape. We are born with it and if we do not trust Jesus for the remedy we will die in it. 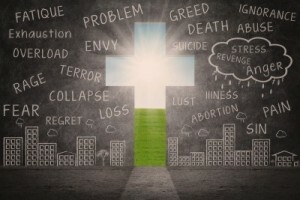 Sin, one dictionary definition is “A transgression of a religious or moral law, especially when deliberate.”  That’s about the closest definition to what the Bible says, although since we are born in a sinful condition, I would say that sin, whether deliberate or not, is something we all do. Take a look at what some others are saying about sin. Here are 25 Christian quotes about sin. Every human is a sinner and every human is offered the same gift – Jesus Christ as the Savior from the wages of sin. Sin is a subject that is continually avoided in our world today but the fact of the matter is that sin is real! Many Christians don’t talk about it and many preachers don’t preach about it, even so the Bible says “For the wage of sin is death; but the gift of God is eternal life through Jesus Christ our Lord.” (Romans 6:26) Every human is a sinner and every human is offered the same gift – Jesus Christ as the Savior from the wages of sin. Do you know Jesus? If not I pray that you choose to come to Jesus today. Do you really believe actions one preforms as a human can change God’s love. Jesus always spoke of the faith (belief) of the people He interacted with. Maybe it’s not so much what you do but what you believe about what you do.